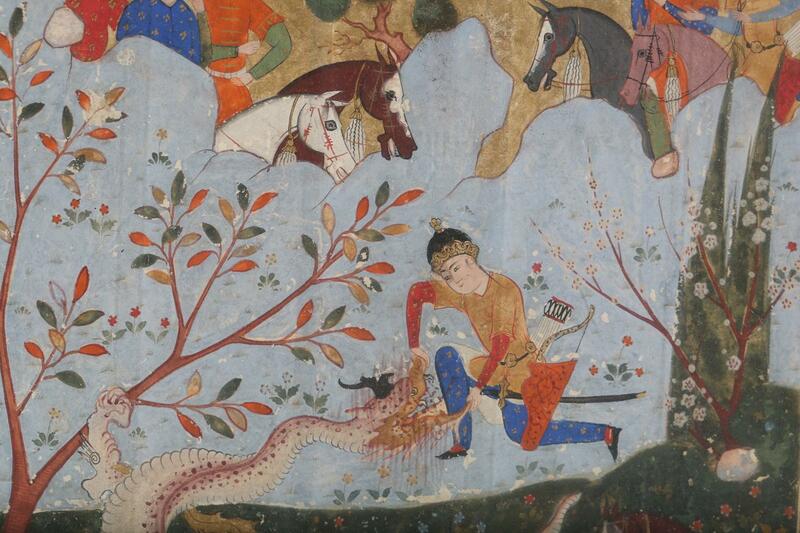 Persian Miniature Paintings: At the heart of the Persian Court, which saw several dynasties each with its own artistic tastes, lies a rich history of cultural patronage. Commissions shimmered with page after page of gold and silver, crushed lapis, and sweeping calligraphy, and all contained between the covers of a book: mere inches of paper in which the artist packed details down to the gilded weave of a tunic and the lines in the hooves of horses. 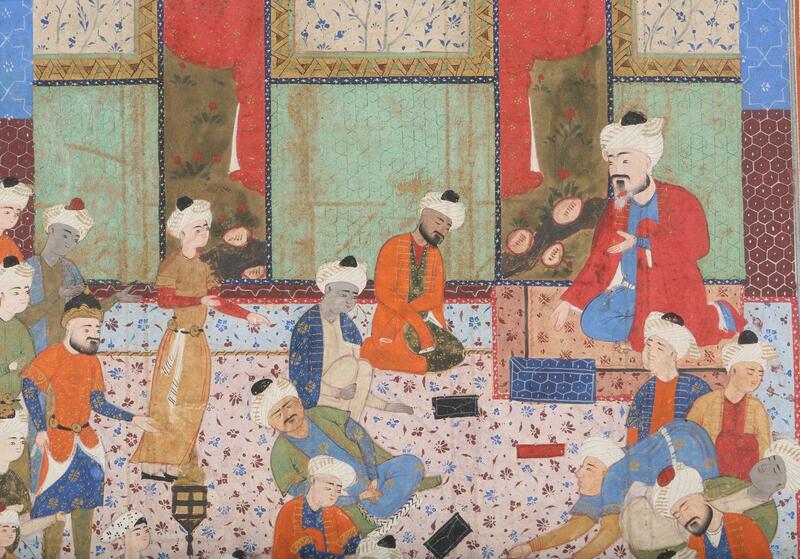 In two auctions presented by Lark Mason Associates there are several miniatures being offered. The details of these miniatures reflect the artist’s care and precision with each stroke of his brush. The sumptuous nature of the Persian miniature limited its consumption to members of the aristocracy, making them rare and highly desirable. In the two sales on iGavelAuctions.com we find examples across the spectrum of value and design, from 20th century works such as this scene in the style of an earlier manuscript to older examples with geometric compositions and intricate depictions of architecture. 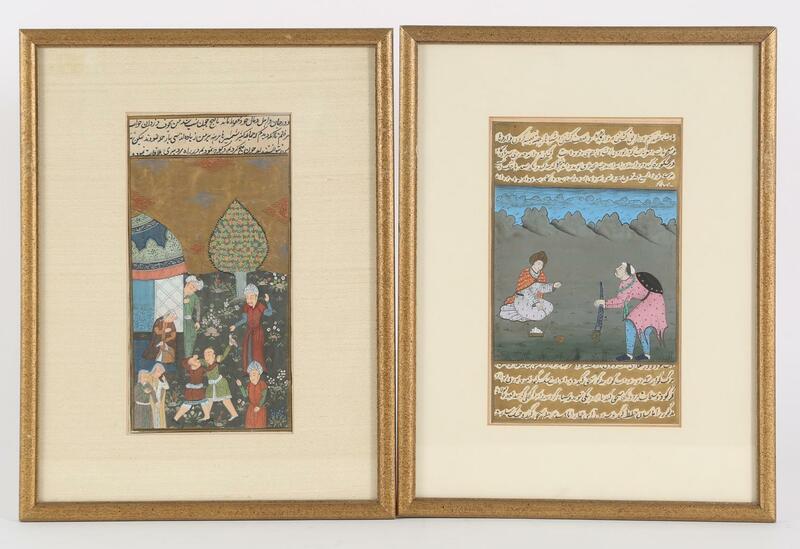 Three Indo-Persian miniature lots close Tuesday, October 17th, and four more charming miniatures are being offered in the October 26th Asian, Ancient & Ethnographic Works of Art Auction. To read more about the history of these beautiful, small paintings, this Christies article by Behnaz Atighi Moghaddam, the Islamic art specialist in London, in which he outlines the styles of workmanship throughout the the history of these charming and often very expensive paintings from the 13th/14th Century Iklhanid period through the 19th Century.